But you can automate your online business, thanks to CMS Suite by DMXReady. At its core, CMS suite is an advanced Content Management System (CMS) that helps make managing your website (and running your business) easier. But it's not just a website - it's a complete suite of web applications that allows you to let your business essentially run itself. By moving your business processes to your website, you will save time, money & headaches as your business runs itself! Order Management - Use PayPal IPN (Instant Payment Notification) to instantly fulfill orders and deliver digital goods. Lead Capture Forms - Capture lead contact details through web forms (Join Mailing List, Contact Us, Request Quote, Trial Sign Up, Request More Info, Sales Order, Pre-Order, Sweepstakes Contest Entry Form etc.) and store all details in centralized database. Directory - Publicly or Privately publish list of members, staff, employees, suppliers, clients, organization in list thumbnail and detail view. Item Price List - Provide quick reference to price list that user can view or download from web. 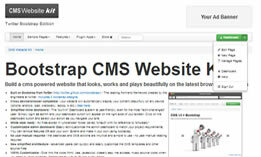 Live XML Sitemap - Allow google to crawl a dynamically generated sitemap that will include new pages. Ecommerce Store - Allow Customers To purchase your products/services from your website. Accept credit card payments using PayPal. Sales Order Form - Create a sales order form that customers can fill out from your website. Once the form is submitted, contacts are stored in the database and email auto-responder is sent to admin/customer with full details. Sales Document Library - Create sales documentation intranet library for your reps. Secure Client Area - Provide sales related info through password protected "clients only" area. Sales Rep Directory - Publish list of members, staff, employees, suppliers, clients, organization in list and detail view. Product Showcase Micro-Site - Launch new products/services through separate "Showcase" micro sites. Mass Email Messaging - Send email newsletters and announcements to clients/members who have registered to your site. Register To Download (Lead Capture Form) - Capture leads through online contact/quote/registration forms. Contact details stored in database. Student Support Portal - Organize and maintain student documents, forms and downloadable files. Event Calendar Listing - Organize and maintain calendar of event listings on your website. Employee/Staff Intranet - Setup a password protected "self-service" intranet/portal site for your employees/staff. Operations Manual - Publish company policies/procedures through an "Employee Only" micro site. Employee Support Portal - Publish and manage operations documentation, tech notes, training manuals etc. Company Knowledgebase - Publish your knowledgebase to save time avoiding email questions and calls. Policy & Procedures Portal - Publish and manage operations documentation, tech notes, training manuals etc. Employee Intranet - Setup a "self-service" employee only intranet site to store all your employee manuals, handbooks, documents online. Employee Blog - Publish a "Staff Only" blog. Employee Store - Setup an Employee Store. Employee Classifieds - Setup a classified web page/site for employees only. Staff Email Announcements - Communicate with staff through the built-in bulk email-based messaging system. Send newsletters/bulletins to your staff with one click. Employee Training Portal - Publish and manage operations documentation, tech notes, training manuals etc. Dynamic Price Lists - Provide quick reference to price list that user can view or download from web. You Own the Software - CMS Suite by DMXReady is downloadable software that you host on your own server. No monthly fees AND you can customize or modify the code any way you like! Virtually Unlimited Configurations - With several different applications you turn on and off within the website, you have full control over the functionality you need. Built-In Ecommerce - CMS Suite by DMXReady includes an ecommerce store that automatically connects directly to your PayPal Merchant Account. Easy Website Management - Once you've installed your website, adding new products or pages is easy using any standard web browser. Upload images and other content from within using the live wysiwyg editor. Documentation to Help You Launch Your Automated Website - CMS Suite by DMXReady is more than just software - we offer numerous resources to make getting your website and ecommerce business up and running faster. Let Your Website Do the Work for You! - The whole philosophy of CMS Suite by DMXReady is to give you a fully automated website that does the work for you, so you don't have to waste your time taking care of mundane office tasks. It takes care of the day-to-day details so you can focus on growing your business, developing new products, or (if you choose) just lazing by poolside. You get the software, resources and plan on how to automate your business. "No matter what your business, your website should be at the core of all your business automation activities"
Request Your 15 Day Free Trial Today!